I was not an overweight child until I reached puberty. When I started putting on weight, I started getting teased by my brothers and sisters. My nickname was "Ellie the Elephant". I tried one diet after another during my high school years and was prescribed "uppers" several times. 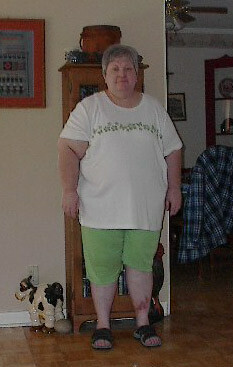 I weighed 172 lbs when I got married and managed to lose 30 lbs through Weight Watchers in that first year. It all went crazy after that. We tried to start a family and found out that neither of us was fertile enough. That was a blow to me since I came from a large family and had planned on one for myself. Food was my comfort and since both of us love to eat the same things, I had a partner in crime. Flash forward 33 years and I found myself weighing 284 lbs. With a 5'1" frame, you can just imagine how hard it was to move or feel good about myself. I had high blood pressure, type 2 diabetes, cholesterol issues, and sleep apnea. I did not want to face the rest of my life as a prisoner in my own body or to spend the rest of my life on prescription medicines for weight related illnesses. I was researching the lap-band procedure when I happened to watch the Gil Gerard show on Discovery Health. Wow! What a miracle! I took down the information and immediately researched the surgery on the internet. The more I read, the more I believed this was what I was looking for. The short down time, located near my home, the convenience of support and the ease of maintenance were all important factors in my decision. I read and reread the manual several times. (I marked it in several places and refer back to it often.) I started work on my packet in February and had mini-gastric bypass surgery on April 20th, 2007 with Dr. Peraglie in Davenport, FL at Heart of Florida Hospital. I don't remember anything after they gave me the "happy juice" until I woke up in the recovery room two hours later. My surgery took 53 minutes and I was bypassed 7 feet. I walked most of that night to be sure I had worked out any gas hiding in my system. I had some blood build up behind one port. The first time I bent over, it blew out and scared the nurse. It was no big deal but left a sizeable bruise on my belly. I was pretty tired the first few weeks until I got on solid food and was into a regular routine with vitamins and such. I eat about 5-6 times a day and drink all day. I am not back on any of my prior meds although I check my blood pressure and blood sugar. I have been gardening this summer in the Florida heat! I never would have spent more than 10 minutes bent over before because my face would be beet red from the exertion. Now I can spend long periods working outside as long as I have Gatorade with me. Life is wonderful. As of today, I weigh 178 lbs., am 5'1" tall and am 54 years old. That's 100 lbs gone in 8 months and my labs are great! P.S. Sure wish I could post an after picture. Elinor blogs at Elinor Reynolds MGB Journey and you can see an "after" photo there! Elinor, thanks for telling everyone about your experience. I'm thrilled that you're attending to your aftercare, that you're happy with the results, and that you're experiencing real health benefits! I hope you'll consider writing back periodically (by commenting on this page) to keep us up-to-date!